The comprehensive solution for tracking and documenting on your patients through the course of their care. See for yourself how this web-based, customizable application will revolutionize your patient navigation. I simply don’t know what I would do if I didn’t have this software program. When you have a couple hundred active patients on your case load at any given time that you are responsible for following up with, it’s absolutely necessary to have a way to stay organized. 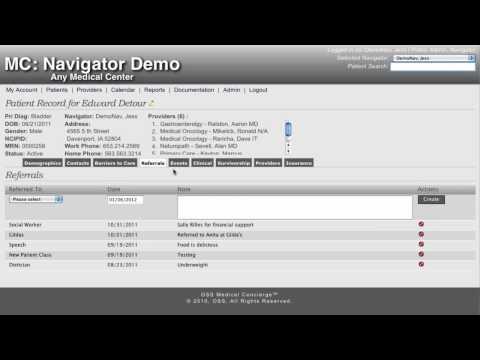 I’ve used Medical Concierge Navigation software for over five years. Very user-friendly, developed with nurse navigators input. They’ve been forward-thinking when trying to keep up with standard requirements (Barriers, Distress, Survivorship). It’s easy to make your own changes. I made a few additions to track my Low Dose CT scan patients. We created an online survey so the community could review our website to see if they met the High criteria. They are automatically loaded into the system to contact / follow. Medical Concierge is a good system for documenting barriers and resolutions with good adhoc reporting capabilities. This application offers a central resource for tracking breast cancer patients through their diagnosis, treatment and beyond their survivorship. Mclaren Northern Michigan highly recommends. Medical Concierge has been instrumental in our navigation practice for documentation. As a supervisor, I can run metrics on our volumes, barrier and referral summaries, outmigration and much more. This software has been asset to our practice!